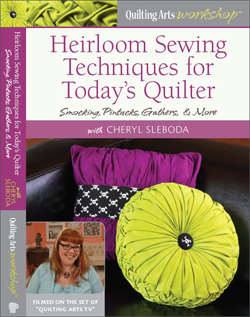 weekly quilt; technique of the week – Page 5 – Cheryl Sleboda – Textiles. Technology. Texture. Teacher. 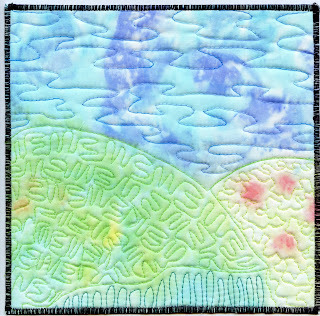 This technique was inspired by Kelli Nina Perkins, a fabulous mixed media artist whom I have the great pleasure of knowing, and a technique she shared on Episode 306 of Quilting Arts TV. This technique is how to take a medium by Sculpey, called Translucent Liquid Clay (TLC), and bake it onto a laser print copy to transfer the image onto the clay. The clay is soft and can be stitched through. I changed a couple of things, but had fun with this technique. First off, you have to find the TLC, which was no small task. Michaels no longer had a spot on the shelf for it, and Kelli mentioned Hobby Lobby as an alternative. I’m glad she did, though my pocketbook is not, I spent a lot of money in that store! Next up, you have to find an image. 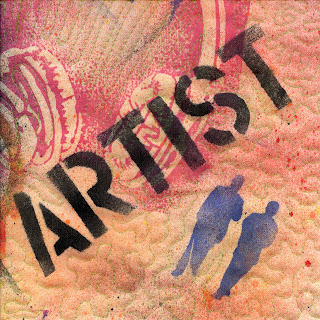 I was trying to make this image into something usable for a thermofax screen, but it didn’t work out for that, so I recycled my laser copy into artwork for this project. The tv show with Kelli shows her using a color copy, and this is black and white. Hmmm. Using the clay is easy according to the directions, and it does tell you this stuff STINKS. Open a window, use your ventilator. Ick. From there you wet and scrape the paper off of the back. Now, this is “translucent” clay, not transparent. So, this did not have the see-though effect I initially thought, and I can see why you would use a color copy now. However, I took some fabric paint to the backside to color in the squid, and am happy with that effect! It sewed easily and I can think of some other uses I would love to try this on. Hope you try it and have fun! Before you cry out “But, Cheryl! This is supposed to be week #15!” I looked back at my posts and realized there are two number 8’S! So, instead of correcting all of those posts (which frankly sounds exhausting) I’m kicking off this week with the correct number. Thanks for your understanding. 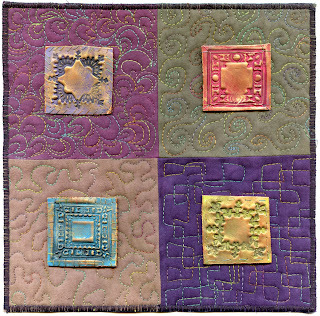 I learned this FUN technique at the International Quilt Festival at the Quilting Arts/Interweave Booth. If you have never been, they have a classroom on the show floor called “Make it University”. 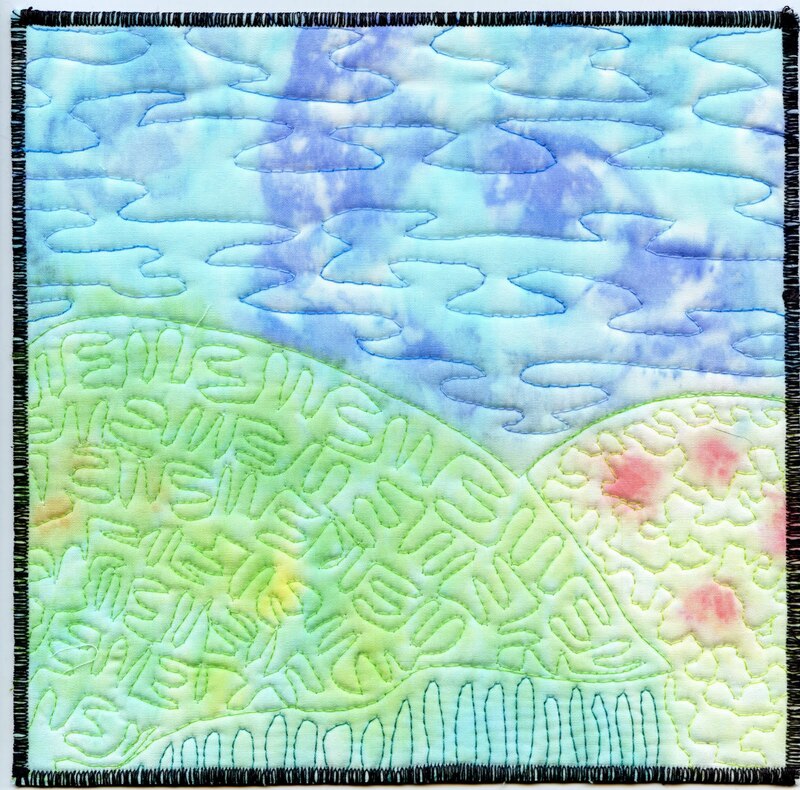 The teacher of this class was Belinda Spiwak, also known as “CrazyArtGirl” and is a fellow moderator on the Quilting Arts website with me. 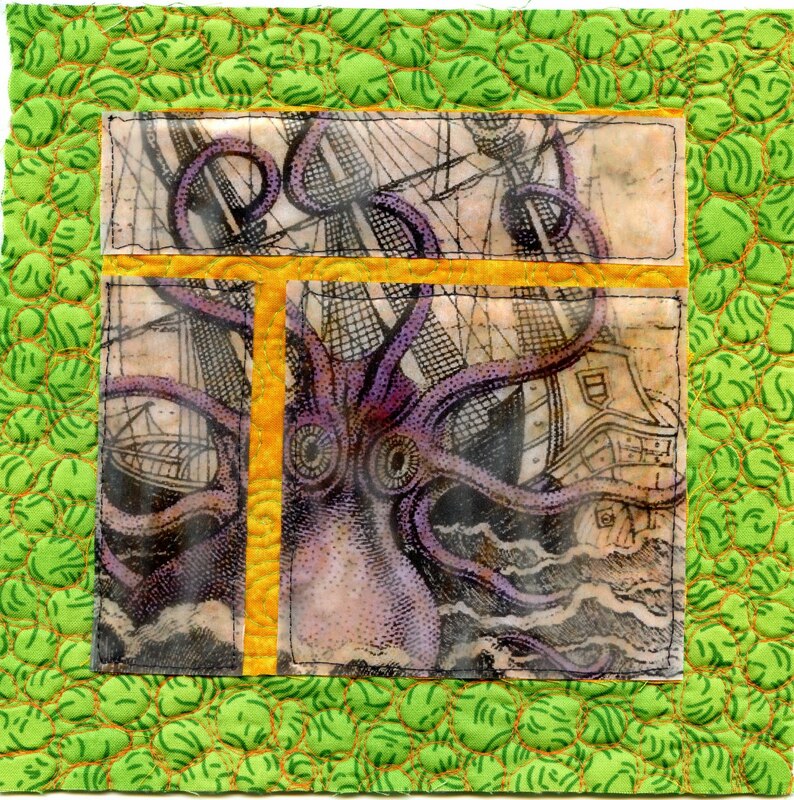 Belinda is a fabulous altered art artist, and has been featured in many books, magazines, and even on TV! This technique starts off with Tulip Brand fabric spray paints (in eco friendly and non smelly pump bottles). The best part is accumulating the stencils in which to “tag” your fabric. The process takes no time at all, lay your stencils down and spray away. The “overspray” of the edges are your stencil just add to the graffiti effect. Belinda was great to show us to layer the lighter colors on first and and then the dark and/or black colors. It was quick! I did 3 large pieces of fabric in under an hour. 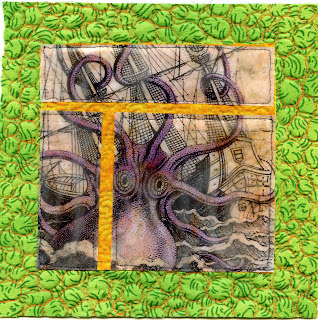 She used a canvas type cloth, but how fun would this be to over dye existing “ugly” commercial fabrics or even a t-shirt! 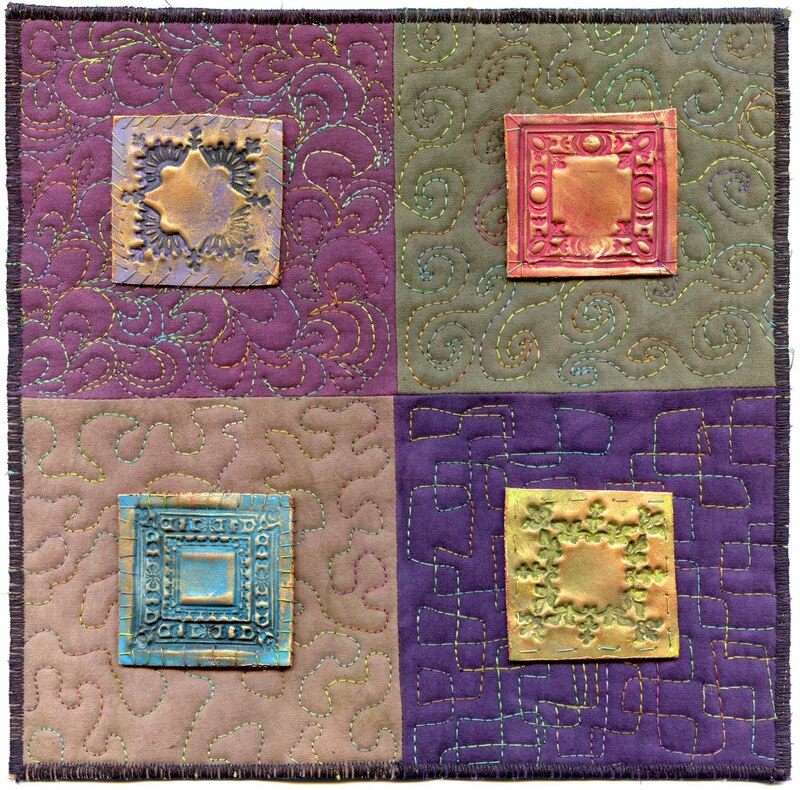 I was shown this technique by Pokey Bolton, editor of Quilting Arts, at a Make It University make n take class about 2 years ago, and have never tried it. Playing with Crayola Model Magic is addictive, because once you open your pack, you sorta have to use it because it will dry up and cannot be resealed. I opened my pack in the evening and rolled out thin sheets on the stuff and pressed various rubber stamps into the surface. Right out of the package, the foamy clay stuff will stick to your rubber stamps, so what I did was roll out the foam so it was nice and smooth, and let it dry to form a bit of a skin, for about 10 minutes, and then pressed my stamps in. I also rubbed the palm of my hand over the stamp before I did, transferring some of the oils on my skin onto the stamp to help prevent sticking. You then have to let this stuff dry, I chose to do so overnight. The next day, I painted the surfaces of the foamy shapes with various paints, and rubbed on some metallics for that extra shine and luster. The neat part is that this stuff is super soft and can be sewn through. I chose to use a hand sewing technique, because I felt the machine might put too much pressure and tear the thin foam surfaces I had created. I was really happy with the embellishments I made, and with enough stamps or other fun things to push into the foam, I can see making more stuff to stick to quilts in the future. So what is “bleeding tissue paper”? Well, I bought a pack of multi colored tissue paper at Michaels for a tissue paper background that you can sew through way way back. When I got the packet home, it said it was specifically “bleeding” tissue paper, and boy-oh-boy, it really bleeds when you get it wet. I have always wondered if it would transfer to fabric, and here is my result. I used PFD (Prepared For Dyeing) fabric, and various colors of the tissue paper and layered them on in little torn strips on the wet PFD. I then sprayed the tissue paper witha mister to get it really wet so it would bleed down into the PFD fabric. After the paper dried, I scraped off the tissue paper, ironed the fabric with a hot iron and washed the fabric in warm soapy water until it rinsed clean. The colors lightened, but did not wash out. First of all, DON’T do this on a windy day or in a breezy room. Also, you will get this all over your hands. Another lesson learned was that for more color, I needed to layer on the tissue paper. The section on the right did not, and it came out a bit light. Another thing is that this method has unpredictable results. You may or may not get a texture or color you want. Or, the colors can bleed together where you don’t want them. I likened this to a watercolor or pastel painting that’s been soaked in water, colors bleed and spread, and lightened too. If you planned to go back in and draw in your lines, like I did with thread, it’s a great technique. But if you’re like me and prefer more predictable results, this was at least fun to try. I was sent a video to watch with this great animation of a single line in red. 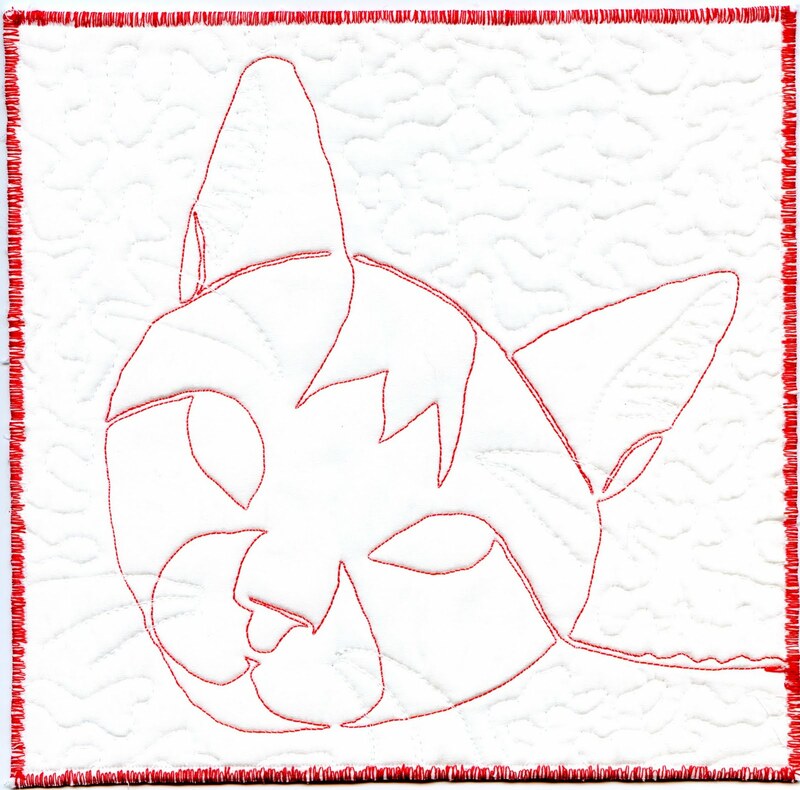 It has a single red line that morphs to become various objects, and I thought immediately of thread on a white fabric. This photo of my cat, Bastet, was chosen out of hundreds of cool photos, mainly because of its simplicity. The photo was printed out full size onto printer paper and the line the thread was to follow was traced out in marker. 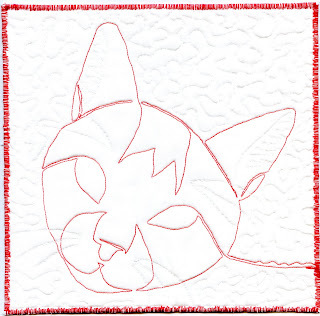 This was transferred to the cloth with a water erasable marker, and stitched on that line. I chose specifically not to have my lines cross or touch if I could help it. It’s a cute depiction of an ornery cat!